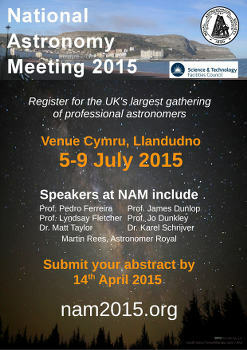 The Royal Astronomical Society is proud to present the National Astronomy Meeting from 5-9 July 2015. The meeting will be held at Venue Cymru in Llandudno, north Wales. We look forward to welcoming you! NAM 2015 also incorporates the annual UK Solar Physics (UKSP) and Magnetosphere Ionosphere Solar-Terrestrial physics (MIST) meetings. Any other bodies who are interested in sponsoring the conference should contact the Local Organising Committee.